I think I had better remind readers yet again that I do not enable comments which even hint that Jorge Bergoglio may not be the true Bishop of Rome and Successor of S Peter and Vicar of Christ. Throughout history, even when a pope has been a heretic, it has never been suggested that he might have somehow lost his Office. Even dear Pope Honorius, who was condemned as a heretic both by his successors and by an Ecumenical Council, was never said thereby to have lost his papacy. Who knows what condemnations PF may subsequently come under ... but it would be utterly contrary to Tradition if he were declared to have forfeited his office. You can't have Tradition when it suits you and forget about it when you don't like it. We have to live in the real world, and that is a world in which the current Roman Pontiff's exercise of his duties is profoundly and (it seems to me) manifestly flawed tam in fide quam in moribus. But he is still the Roman Pontiff. Attempts to avoid this fact constitute childish attempts to avoid what may be our duties in the current situation, and to live in a private fantasy world. Nor will I accept comments which dispute what I have written. Ego locutus sum, causa finita est! How about Egomet ipsissimus? Let your foes tremble! “Hi. Hey you know this abuse stuff? Bad isn’t it. Very bad. I can’t help feeling that we should make reparation somehow. Apologise to the victims in more concrete terms than we’ve done so far, and beg God’s forgiveness for the unspeakable plague that our unfaithfulness has unleashed. Might I suggest the following…. 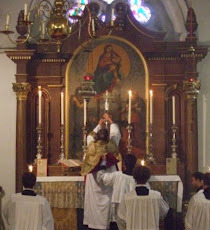 Firstly, a worldwide Day of Atonement, wherein every Catholic parish on Earth mandates a day of prayer vigil/Exposition and celebrates a Mass for the abuse victims and for priests who have betrayed their vocations; and, most of all, let every Catholic be encouraged to approach the Confessional on this day, in a spirit of joyful repentance and a renewed determination to follow the timeless, lovely, and unchanging doctrines of Holy Mother Church. Let each diocese designate its local Marian shrine (as Mary is the model of purity) a pilgrimage venue. The pilgrims will obtain a plenary indulgence upon their attendance at the said shrine with the intention of interceding for souls damaged by the appalling actions of our priests and bishops. Finally, please promulgate formally a Novena to be said, on pain of sin, by every Catholic in the world, imploring God that we may henceforth find priests and bishops who will live out their celibate vocations faithfully to the very limit of their capabilities and who will oppose with masculine vigour the moral relativism that has spawned an effeminate priesthood and a large-scale apostasy of the laity from many of the basic tenets of our religion - the results of which have become all too obvious: a Church often unfaithful to its mission, and collateral damage to innocent victims. I think you are historically right that no one ever accused Honorious of losing his office. I also fully affirm that Pope Francis IS the Pope. However, canonists over the centuries have disagreed about this very issue. I do think that's worth acknowledging. Father, undoubtedly Francis is the Pope. Tragically for the rest of us, his understanding of the Petrine office seems to be 'Ego locutus sum, causa finita est!' Accountable to himself alone. Titles may not be debatable, but subtitles are fair game. I would quote someone from an internet forum: 'Francis is in Rome, he has the power.' He very much holds the power of Pope and office. If his words or actions can be construed as heretical, that later he might be ruled a heretic, it does not matter, he remains Pope, no matter how many times out of context quotations are culled from writings of St Robert Bellarmine and others. I think it would be better still if you had a rule stating that you will not allow comments regarding the present situation that make our Lord Jesus Christ to be a fool or a liar . Probably because NO ONE can be "foreknown as damned". I fully agree that PF is the legitimate Pope, with the Spirit guiding that choice in the college of cardinals election process, even if some of those cardinals may have had what they believe were their own motives for their choice. Having said that, I also believe that the election of PF was for the purpose of bringing to a head, though his predictable actions that have been plaguing the Church, the sickness of a divided Church-- a de facto schism-- that has been eating away at the fabric of the bride of Christ for too long. That is saying nothing more than did the prophecy of BXVI 50 years ago, in is anticipating a smaller, purer Church. We shall indeed get the former, let us pray it will also be the latter, when this dark time is past... which likely will get darker still before then. You don't need to be a Catholic in order to be a Pope. It's the God of Surprises, stupid. Keep up. One reflects on the words that Saint John shared with the Lacedaemonians. The people who are making the greatest mistakes in these moments of crisis may not be the usual suspects. this will be most probably only between the two of us. Mr Waters, excommunications and other censures exclude a cardinal neither from either voting in the papal election nor from being elected, and this law has existed for a long time! 34. Nullus Cardinalium, cuiuslibet excommunicationis, suspensionis, interdicti aut alius ecclesiastici impedimenti praetextu vel causa a Summi Pontificis electione activa et passiva excludi ullo modo potest; quas quidem censuras ad effectum huiusmodi electionis tantum, illis alias in suo robore permansuris, suspendimus. — None of the cardinals can be in any way excluded from the active or passive election of the Supreme Pontiff by pretext or cause of any excommunication, suspension, interdict, or other ecclesiastical impediment; which censures, indeed, for the purpose of this election only, we suspend, while they otherwise remain in force. CIC 1331 provides in section 1 that any excommunicated person exercises ecclesiastical jurisdiction illicitly, but in section 2 that only one whose excommunication has been imposed or declared exercises jurisdiction invalidly. But Father...without entering into the questions of whether Francis is pope in the real world and whether we have to live in it and these reasons for answering in the affirmative, I am surprised that you accuse those who would dispute this analysis of cafeteria traditionalism. As surely as it was not the intention of the First Vatican Council to teach that the pope could not lapse into heresy even as a private person, so the instinct of many Catholics of that generation was to forcefully contest the idea that this had ever happened in the past. The Life and Life-Work of Pope Leo XIII (1903), which according to the title page was "Endorsed by the Entire Catholic Hierarchy of America," incorporates an address given by Archbishop John Baptist Purcell of Cincinnati upon his return from the Vatican Council, in which he recounted how his doubts and reservations about the definition of papal infallibility had been gradually overcome. It gives an interesting view of the mind of the Council Fathers: "Where we to consider [the erroneous teachings of Nicholas I, John XXII, and Honorius] ex cathedra on those occasions, and pronounce an anathema? I will not delay you by adverting to other instances of the kind, but I was most happy to hear the entire council, as one man, concerning those of whom I spake, answer me, 'Those Popes never addressed such doctrines to the universal Church. They only spoke to individuals. They did not speak as pastors of His universal Church, therefore they did not speak ex cathedra.' I cannot tell you what a load that removed from my mind.... The question was also raised by a Cardinal, 'What is to be done with the Pope if he becomes a heretic?' It was answered that there has never been such a case; the Council of Bishops could depose him for heresy, for from the moment he becomes a heretic he is not the head or even a member of the Church." And Cardinal Billot, in his Tractatus de Ecclesia Christi, defends the thesis that the power of the supreme pontificate cannot be lost in any way other than voluntary abdication, "si...supponatur impossibilis casus Pontificis qui per haeresim notoriam desineret esse de Ecclesia", which indeed he holds has never happened and never will. However, he says, "Facta ergo hypothesi papae qui fieret notorie haereticus, incuncanter concedendum est quod ipso facto amitteret pontificalem potestatem, dum propria voluntate transferretur extra corpus Ecclesiae, factus infidelis, sicut bene dicunt auctores quos immerito, ut videtur, confutat Caietanus" (emphasis original).